First, a question: have you ever wondered, for yourself, why your hair and skin feel a bit weird after a shower? Even worse, they both keep feeling weird and start to LOOK terrible after a while? If you do, well then, you’re not alone, as a matter of fact. Lots of other people (that includes me for a while) have also experienced itchiness, dryness and irritation after showering in unfiltered tap water. It’s time for you to start considering picking up one of the best shower head filters to put this matter to rest permanently. I say, first, we take a better look at the cause of such annoyance and, later, at which product would be the most suitable one for you. Why do we need a shower filter? Studies have shown that the number one suspect for dry, itchy skin and weak hair is the water that runs in our houses. And I think you all know what it is in our water that causes that, or at least make a guess in the ballpark: disinfectants and heavy metals. In truth, water is rarely just… water. In many cases, water prior to being pumped towards households, is disinfected with chlorine or chloramine. As those substances are beneficial to some aspects of our health, they are not so nourishing to the human skin and hair. Is your shower water safe enough? Also, along the pipes, chemical reactions can occur, leading to the creation of disinfection by-products, causing unpleasant taste or smell, or even rendering water unsafe for consumption. To deal with heavy metals (lead, mercury, etc. ), chlorine and chloramine, specifically in the shower, shower head filters were introduced and have been the number one choice for such issues. These filters are known to remove various potential harmful elements – so effectively you can actually FEEL the rejuvenation at the first try. I am going to make a quick list of filters that, to my knowledge, offer the best prices and utilities. Please, for the sake of your own skin and hair, and Buffalo Bill, buy yourself a shower filter ASAP. Hope this will help! Drop a comment if it does. Thanks! In case you are a person of your own knowledge and opinion who prefers to do your own research on desirable products, here are some things that should be looked at prior to a purchase. Different products apply different methods to suit different needs. Therefore, there are quite a few of them. Make sure that you know what needs to be filtered out of your water, then do a quick check of the technology offered. Keep this in mind: filter cartridges are not meant to last forever. You will have to replace them once in a while, but NOT every week. Typically, they last an average of 6 months, depending on the amount of showers you take, despite other claims. You definitely don’t want any trouble in finding extra filter cartridges for your system. It would mean that you would have to buy a brand new set if you wanted to continue your use. So check if you can get replacement cartridges with no problems before you commit to a certain type of shower filter. This might be unnecessary to say, but you should take a look at the reviews on the product to see if it really does what it means to be doing. For many years, countries have been using chlorine as the major disinfectant in their water treatment. However, over the years, many water companies have switched to chloramine because of its long-lasting nature in water pipes and the lack of smell and taste. Though it’s said to be safer as a disinfectant than chlorine, chloramine might lead to skin, eye, or respiratory problems. Still not confident which is the right showerhead filter to install in your bathroom? We’ve made this detailed review of the signature products from leading brands of showerhead filters and filtered showerheads this year, in case you need some references. Here’s our picks for the Best Shower Filters. Talking about a showerhead water softener for hard water, one simply can’t leave the Aquabliss 3-stage Universal to pass. Having been one of the best seller shower filters, the item easily earns a top spot in our list. Introducing the Universal Shower Filter by AquaBliss. This Inline Shower Filter features a 3-Stage System: a mix of KDF-55, Active Carbon and Calcium Sulfite. It traps heavy metals such as lead, mercury, nickel, chromium, removes chlorine and harmful impurities, and prevents bacteria and fungi from growing. The removal of heavy metals has been looked at and believed to lead to quick improvement on the strength of hair strands, hence the reduction of hair loss. Although its efficiency in removing iron, therefore in dealing with hard water, is not that outstanding compared to large water filters, it is effective to a certain extent nonetheless. Adding to that, chlorine ithe n shower has long been proven to be damaging to skin quality and physical health in general. By removing it, the filter prevents further irritation and nourishes your complexion. The showerhead filter performs excellently as a showerhead filter and also would be perfect for those who want to test out what water softeners can do at an almost next-to-nothing cost. At under $35, plus a universal design that works with all shower types, including rain fall and handheld showers, this filter is certainly one of the best rated and most favoured by customers everywhere. The cartridge lasts 6-8 months or after 10,000-12,000 gallons of water use, whichever comes first before a replacement is needed. You can look to buy more filter cartridges right here. If there’s any dissatisfaction within the first 30 days, AquaBliss will happily refund your money and take the product back. Additionally, a 1-year warranty is also offered. Chlorine is responsible for skin irritation and illness, while dissolved solids have harmful effects on hair strength. By eliminating both, AQ-4100 will improve your complexion and issues with hair loss to a significant extent. The filter offers double filtration with coconut shell carbon and KDF copper/zinc media – a combination applied in many advanced household water filters to get rid of chlorine, heavy metals like lead, mercury etc. and other volatile organic compounds from your tap water. There is a particular concern regarding how the said media don’t work as advertised. But don’t you worry! The coconut shell carbon and KDF filtration combo have been certified by the NSF to standards 42 and 61, which guarantee that the products tested are safe to use and effective in removing aesthetic impurities, including chlorine. Moreover, this seemingly bulky piece of lavatory equipment is actually very easy to install. It takes most people about 10 minutes, depending on their existing shower, to set it all up. The bulky look, however, is not there without reasons. It’s designed to give room for thick layers of coconut shell carbon and KDF 55. The filtration mechanism also allows for longer contact time with the media compared to other canister designs, resulting in more efficiency. Admittedly, the product is no “youngster” concerning the slightly outdated design. That being said, it is a veteran in the market and proves to be aging wonderfully. Additionally, Aquasana is a brand with no small reputation of appreciated quality. The AQ-4100 deluxe lasts for 10,000 gallons or 6 months of shower use. Adding to that, the company offers Water for Life autoship program for replacement filter cartridges, a 1-year limited warranty and a 90-day full-refund guarantee. Now the rising star of the shower head filter business, the AquaBliss 12-stage SF100 has surpassed many other opponents to become one of the best filters to have ever surfaced. It’s not without cause that consumers are crazy about this particular product out of all inline shower filters out there. Its affordability in association with what it has to offer – a 12-stage filtration system that not only eliminates and inhibits unwanted, unnourishing elements, but also revitalizes damaged skin and hair. To put it in simpler words, the item uses a stack of 12 different, specially designed ‘sieves’ to filter shower water and make it fresher. Let’s investigate these methods of water purification in depth. Stage 1 (fine stainless steel mesh) intervenes with medium-sized sediments, preventing them from entering and damaging the filter itself. Stage 2 (micro-porous PP cotton) sets up a tight net that blocks out even smaller particles, including dust and turpitudes. In stage 3, a layer of the familiar calcium sulfite – very effective mean in removing chlorine – drags the said substance straight out of the water, be it hot or cold. The KDF55 is also featured, in stage 4, to further filter chlorine, heavy metals, bacteria and algae, even in hot water. But it’s not done yet. Every bit of chlorine that somehow manages to pass through, along with trihalomethanes (THM’s), organic materials and impurities, will once again be tested and fully stopped by the activated carbon layer in stage 5. Now, in terms of restoration, stage 6 to 10 are specifically designed to improve the condition of our skin and hair. Zeolite ceramic balls in stage 7, ceramic balls in stage 8 and tourmaline in stage 9 will aid with trapping heavy metals and releasing vitamin C, revitalizing minerals and beneficial elements into water. Better yet, stage 6 with infrared balls raises the level of negative ions and oxygen in water and magnetic energy balls in stage 10 further enhance the oxygen quantity to reform your hair, skin and nails. Finally, another two layers of fine stainless steel mesh and PP cotton stand at the exit to trap any remaining sediments inside the filter, leaving your water purified and transformed. At this point, we should just call it a shower water filter system. A simple ‘filter’ just doesn’t feel good enough. Regarding other aspects, the famous universal, no-tool-required design of AquaBliss filters that fits with all types of shower head has to be mentioned. Plus, the long-lasting cartridge won’t be needing replacement after 10,000-12,000 gallon or 6 months of normal use. In the first 30 days, if the AquaBliss 12-stage SF100 fails to perform, the company will refund your money in full and withdraw the product. It is also covered with a 1-year warranty. Recently, Vitamin C has been considered as one of the dechloramination methods in AWWA (American Water Works Association) Standard (AWWA, 2005b). This water filtration method has brought about such successful results that many manufacturers have adopted it to their shower filter system designs. One of them is Sonaki, the no.1 water treatment brand in Korea. I am betting good money that Korean models with goddess-like skin would know a thing or two about Vitamin C shower filters. The Vitamin C Inline Shower Filter Assembly by Sonaki has continuingly been the Amazon’s Choice for “Vitamin C water filter”. This product promises a 99.9% chloramine and chlorine reduction in disinfected water, which will absolutely bring a reform to your skin/ hair. Not only that, it is not without a transparent cartridge for easy filter checking, completely made of Brass and Durable resin with a chrome finish, which provides a luxury feel. Also, the package includes 3-Vitamin C filters and a wrench for changing out filters. Each cartridge life span varies around 1400 gallons. Oh, have I mentioned that you don’t have to replace or change anything major in your bathroom to install this product? You’ll just have to attach it to your existing shower arm and head and you are good to go. The process is unexpectedly easy. The price for the assembly is somewhere between $60 and $80. I understand it is a bit expensive for a shower filter. But hey, some people would tear down a house! Just saying. Also easy to install, Culligan wall mounted is still one of hottest filtered showerheads (yes, pun intended). Installation should only take up less than 10 minutes, reading from customer reviews. The filtration system has been tested and certified following ANSI Standard 177 to decrease free available chlorine effectively. Other than that, it can also help with the typical smell and taste of processed water and contribute to the promised low levels of bacteria, scale, mold… Building on that, the shower head offers 5 different spraying settings with easy-to-clean rubber nozzles. The cartridge can filter shower water of 10,000 gallons in volume or 6 months of shower use and the product (housing) is under the effect of a 2-year limited warranty. You can purchase this shower filter on Amazon for less than $35. Don’t want to spend too much on a shower filter? Only curious about how it could possibly help your skin and hair? Then an inexpensive, yet not actually cheap, filtered shower head should do the trick for you. The Clearly Pure Filtered Shower Head has been receiving positive reviews after positive reviews. Of course there are complaints, but nothing of serious matter so far. It’s fair to say that this item is one worth considering. Constructed with plastic as the main material, the unit is expectedly light. With a simple design, it is not a hard task to set it up in your bathroom and to disassemble it to replace the filters when the time comes. Water pressure coming out of this shower head sure is a nice feature, maintaining at 2.5 gallons per minute (GPM). It is not completely surprising since the item adopts the calcium sulfite filtration method only, which has been said to be effective against chlorine. The only noticeable drawback is the occasional leaks or clogs. But with a filtered shower head under $25, it’s a good bargain. Especially true in this case, where the filter can last up to 8 months and the unit is covered with a 1-YEAR manufacturer guarantee. 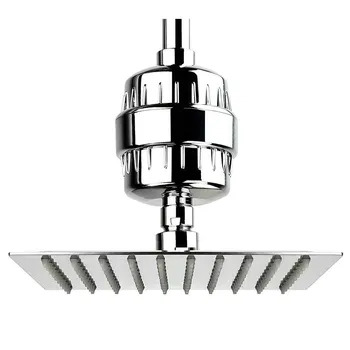 If you are not into luxurious shopping or you are more interested in economical choices, then this filtered shower head should be perfect for you. As another Vitamin C filtration adaptation, plus the incredibly low price for a Vitamin C shower filter at under $40, this particular product is a common recommendation. The shower head is expected to be durable and lightweight, given the fact that it is made of class metal. Laser cut micro-holes that maintain strong and balanced water pressure accompany an integrated swivel ball joint which allows smooth angle adjustments. Regarding installation, it is not much different from other products. No tools are required thanks to its universal design, easily attached to a ½ inch fixed mount and adjustable shower arm. But the best thing about this item is the bonuses: 2 Vitamin C cartridges and 5 bath caps in a premium gift box. Now THAT’s economical! Another worth-mentioning quality of this potential purchase is its manufacturer. Aquahomegroup has been in customer’s favor and stealing their hearts away. According to Amazon customer’s overall reviews on the company, over 90% of them has been positive, more specifically on the customer’s service. Take a look and see it for your own assurance. Okay straight off the bat, this is not the greatest looking water softener shower filter out there. But don’t let looks deceive you. The product is capable as far as shower filters for hard water go. It is partly fortunate that the picture was so unappealing. Because had it not been so, I wouldn’t have had to dig deep like I did to find out why customers love it so much. And as it turned out, there are actually nicer pictures of it. Thank goodness! Getting back to the matter at hand, first of all, it’s a Berkey. It is a brand with no small reputation when things comes around water filtration. Despite the incident with their Black Filters, which has been dealt with, products from Berkey rarely fail their consumers. Second of all, it’s the compatibility of the design with standard shower head types and the easy installation. It’s probably will only take you less than 5 minutes to hook it on to your existing shower head. No problems whatsoever! Third of all, it actually does what it’s meant to do. Reading through the comments section, there are plenty of satisfied reviews on how the item clears out the taste and smell of chlorine right away. The product description says that chlorine, iron, iron dioxide and other heavy metals in your shower should not be a problem any more. Seemingly, it works. There are no major complaints about the filter’s said ability to be found, which is often a good sign. Adopting KDF 55 granules, one of the most popular filtration media, Berkey’s shower head filter can also inhibit the growth of bacteria, algae, scale, mold and fungi. The filter cartridge should last 20,000 gallons or 1 year before a replacement is needed. It is covered with only a 30-day guarantee, so test your product right after you receive it. Sadly, Berkey does not list a warranty for shower filter. Normally with shower head filters, you wouldn’t need one anyway. The filter is available at under $50 on Amazon. Do shower water filters work for hard water? To set the record straight one more time: hard water DOES have negative effects on skin and hair. As drinking water, it may not be damaging, but hard water in showers will surely do a number on hair strands, gradually turning rough and dull. How? Soap in contact with hard water will combine with the dissolved metals and form a film of soap curd. The curd will stick to our hair, making it more and more lifeless and difficult to manage. In addition to that, the film will prevent filth and bacteria from being cleansed off and hinder the skin’s ability to recover back to its normal condition. Which begs the question: how do we effectively remove unwanted minerals and sediments from our water? Since the problem occurs mainly in the bathroom, shower filters seem like a decent choice. However, when put next to other water filtering systems for hard water, they are indeed inferior. All things condidered, the ultimate way to deal with water hardness is a combination of whole house water softeners and shower filters. If someone says that you only need shower filters to deal with the dissolved calcium and magnesium, they’re either misled, or they’re trying to sell you something. Think about it: how can a single, small unit of shower filter completely remove all the sediments and dissolved metals? It NEEDS help. As in, help from a bulky assembly that will take the hard water straight on, like this Fleck 5600SXT which uses ion exchange mechanics – one of the few methods proved to be effective against hard water. I have not enough ideas about it and never take it seriously but after read this article i knowing that how much is important shower head for our skin and hair. N ow i understand what should i do and i am going to purchase some of these. Thank you so much for sharing a informative article also helpful. Tbh I didn’t think there are so many choices. I have seen one, the Aquasana, at my friend’s house and been thinking about getting the same one. Now it seems like I’ve more to look in to. But are there any shower filters that remove fluoride and chlorine both? Thanks! I appreciate you taking the time reading the article and I’m so glad that you found something useful. It is not true that fluoride cannot be absorbed through the skin. Fluoride CAN be absorbed through the skin, just like many other molecules that are below 150kDa. You are absolutely right, fluoride CAN be absorbed through the skin. I do remember reading about it somewhere. I also remember reading that the effect of low concentrated fluoride, in usual tap water for example, was not that severe to be damaging in the shower, especially through skin absorption. I think that’s why I just kind of left it out. But thanks again for pointing that out. It sure will be helpful to others as well. I don’t get it. What’s the difference between the various AquaBliss models? The descriptions sound the same, and they’re all the same price. So what’s the difference? Thanks for stopping by and giving my article a read. The two AquaBliss models mentioned are indeed different. The AquaBliss 12-stage has a filter system that includes the thick stainless steel meshes, the KDF-Calcium Sulfite-Activated Carbon combination and the revitalizing balls. Meanwhile, the AquaBliss Universal only has a 3-stage filter system that mainly exploits the redox properties of KDF, calcium sulfite and activated carbon. In short, the 12-stage is an updated version of the Universal. As for their prices, the 12-stage is actually at a 47% discount at the moment, that’s why they’re at the same price. Original costs of the 12-stage and the Universal respectively were $59.95 and $35.95. So if you want to pick up one, now might be the best time. Thanks again for reading. Hope this was helpful. Your article is super helpful. Some of them seem very high-tech. I’ve started looking for a shower filter after my doctor recommended i get one for my skin. He recommendeda Aquaspace shower filter. Do you have any experience with these? You got me curious as well. I looked for offers on google and they are listed on the official website, but it seem like retailers are not stocking these Aquaspace shower filters yet. I’m keeping an eye out for reviews on that one because DOCTOR RECOMMENDED FILTER !!! Definitely checking that out. Until then, I’m sticking with that Aquabliss either 12 or 3 stage. The two are looking fresh! And to the author, awesome job man. This was indeed helpful. Thanks a lot for another excellent information. This website has been my gateway to knowledge. ? Thanks for this current list on shower filters Ive been looking into getting one and still trying to figure out if Los Angeles water has chlorine or chloramine in it. The report they sent me from 2017 says chlorine amounts many other scary metals and chemicals but their website says they are switching over to chloramine and so trying to get someone on the phone that actually knows which it is currently. Do you know if the Aquabliss or Aquasana filter out chlorine and chloramine? From what I read most filters work best for one or the other. I really want to get one soon I have noticed since Ive moved here my hair sheds so much more and its always limp, dull and dry strays which I never had before living in Chicago or NYC. I thought it was the dry climate which Im sure doesn’t help but the water is well known for being bad here so Im thinking thats the real issue. I am looking for a filter for my hair and skin but also to filter out the terrible chemicals that are not good to breathe when the shower makes so much steam and our skin absorbs so much as well we probably get more contaminants in our system from the shower even though we drink filtered and bottled water here. If you happen to know which filter is best for this area please let me know thanks! Hi, Los Angeles has chloramine in the water- Aquabliss does not help for that. Pelican has some filters that claim to reduce the chloramine and most other stuff. Vitamin C filters are said to neutralize the chloramine. So maybe to be safe it is good to have two filters, that is what I am thinking at this point, even if it annoying and costly. Hey, Sita. Thanks for stopping by. Unfortunately, I think you’re right. Dealing with chloramine is expensive and I guess we just have to accept it for now. But you don’t have to own two different filters, one for each disinfectants. For your information, Vitamin C cartridges can take care of both chloramine and chlorine efficiently, although it is indeed more costly than the regular chlorine filter. I forgot to also ask what you thought of the reviews on Amazon that test some of these models with chlorine and other test strips and find they are not working? Do you think they are accurate tests? Both the Aquabliss 12 stage and Aquasana have some reviews with test strip photos stating that they didn’t remove anything with their test strips but their are lots of reviews that people notice a significant improvement to their skin and hair. How would you compare these two when one is trying to decide what is best for their water are they basically going to do the same type of filtrations? Hi there, Lilly. Thanks so much for stopping by and sharing your thoughts. To your wondering if the Aquabliss 12-stage and the Aquasana filter out chloramine, they sadly DON’T. The two shower filters are specifically designed to manage chlorine, and they’re good at it (NSF certified and all). To deal with chloramine, you’d do well to go for a vitamin C shower filter since it’s currently the best medium for the task. The Sonaki Vitamin C inline shower filter on our list and the the Vita-fresh Vitamin C shower filter are two promising choices. Regarding the unsuccessful water tests, I doubt that it is due to the capability of the two models. The reviews from the majority of users say it all. Plus, the KDF and activated carbon are both NSF certified to standard 42. Do note that shower filters can filter out chlorine only to a certain extent, not COMPLETELY. If the chlorine level is high in the original water, it’s likely that, after filtration, you’re still left with a considerable amount of it. Personally, I think that they may unfortunately have received faulty units. If you ever find yourself with one, both companies offer a trial period (30 days for the Aquabliss and 90 days for the Aquasana), during which you can return the products for a full refund. I hope that answers your questions. Once again, thanks for stopping by. Hope you’re skin and hair will get better soon. Actually, I have a question re. the Aquabliss 12-Stage shower filter. Does it reduce water pressure? Hi, Sandie. Thanks for your question. While most users experience no major change in water pressure, it does happen from time to time. If the water flow is restricted right after installing the filter or after it’s been in use for a while, have a read at this support page to see the possible fixes for the issue.